According to the latest GSMA report, LatAm countries still remain untapped and will add almost 150 million new mobile internet subscribers by 2020. Smartphone and 4G penetration (and coming soon 5G) will continue creating new opportunities for growth, innovation, and a flourishing start-up environment. At the same time, the Latin American games market is the second fastest growing sector in the world, as stated in the recent Newzoo report. This year the region, which includes Argentina, Brazil and Mexico, is expected to generate $4.1bn in video game revenues, a 20% growth YoY. The revenue figures put Latin America just behind Southeast Asia in terms of gaming market growth worldwide. The boost of the mobile ecosystem in Latin America is creating new opportunities, particularly for new, small and medium enterprises that can benefit from increased connectivity to develop content, applications and solutions to add value in new areas. The shift of consumer engagement to mobile devices is also driving a significant growth in mobile commerce and mobile advertising. These and other hottest topics will be discussed at Latam Mobile Summit 2017 on January 25-26th, San Francisco. In its 2nd year, Latam Mobile Summit brings together the most innovative mobile industry leaders to discuss and analyze the latest developments, challenges and opportunities in Latin America’s mobile space. As mobile in the region continues to show phenomenal growth, this conference aims to connect regional industry leaders with the Bay Area, USA and the international mobile community. The gathering is a great opportunity to engage, share ideas and network with attendees from more than 20 countries of Latin America. Meet and collaborate with LATAM's brand and content owners, publishers, independent developers and game studios, payment apps, fintech startups, solution providers, advertising and user acquisition platforms, mobile/network operators, media agencies and the whole mobile ecosystem in Latin America. Participating in Latam Mobile Summit will help you to accelerate the innovation process within your organization, create new valuable connections, build partnerships and expand your business in Latin America. - Fintech & Bitcoin. Mobile commerce & retail. - VR & AR and much more! In addition, the conference program includes site visits to the leading mobile tech companies in Silicon Valley, where our attendees can participate in workshops and get first hand insights from leaders of the world class of innovation. -and many others to be announced soon! As an iUeMagazine reader, you can use the discount code iUeMag that allows you to get Gold & VIP tickets at only $399 & 599 price. 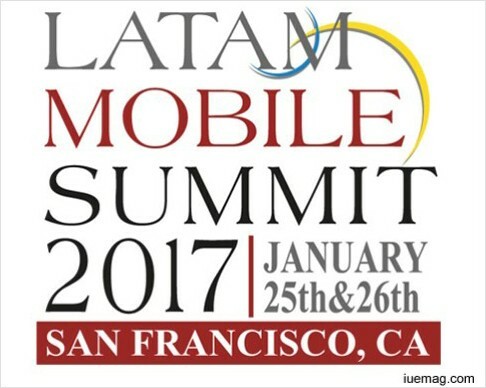 Join Latam Mobile Summit 2017 on January 25-26th for a complete tour of mobile innovation in the region!